Flax has been cultivated as a useful plant since the Stone Age. The flax plant grows to more than a meter in height and its flower is usually blue. After pollination the plant forms seeds containing oil and protein. 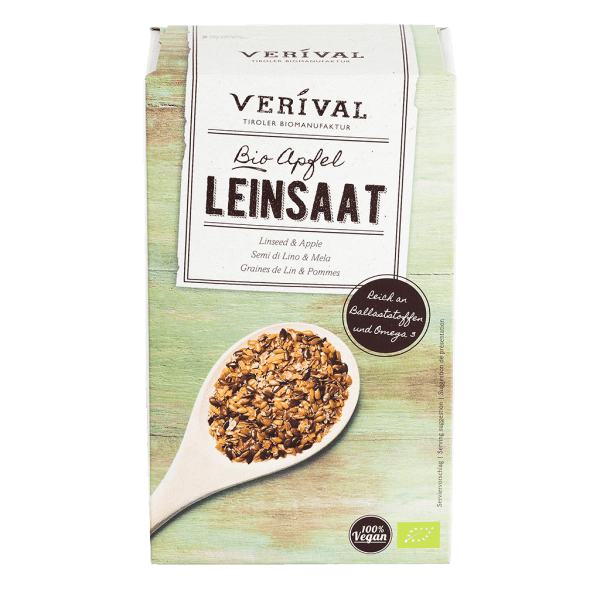 Linseed contains gut-friendly and regulatory bulking agents, which in a natural way stimulate digestion, as well as multiple nonsaturated fatty acids such as omega-3. The fine mixtures of golden and brown linseed, wheat bran with either apple or date and plum granules are very rich in fibre and have a pleasant nutty, fruity taste. To stimulate and maintain digestion, we recommend a daily intake of 2-3 tablespoons in muesli, milk products, salads or juices. Golden linseed* 46%, brown linseed* 25%, apple granules* 17% (apple purée* 40%, rice flour*, apple juice concentrate* 20%), wheat bran*. > May contain traces of sesame seeds, soy, lupines and nuts. > Packaged in a protective atmosphere. > A varied diet and a healthy lifestyle are important!